I can’t tell you how many times well meaning people tried to get the stroller from me in a restaurant or in church to try and put it aside - and when I stop them and hold onto it tightly while saying “Uh wait”, they would look and be surprised to find a baby inside! :D They all think the stroller is for Audrey who is either walking or being carried by her dad. I guess they just didn’t expect another baby to be in there. Having a toddler and a very young baby is quite challenging for hands on parents like my husband and I. The energy that we expend is so much so that we feel like we’ve run a hundred kilometers or more in a day. And during the weekdays, when it’s just me taking care of both girls the whole day, I always get amazed at how tired I am by night time. And they’re girls. If they were boys, I think I would be dead tired before dinner time. My husband’s cousin once told him, ‘You’re not a parent until you have two kids’ – and of course this was just a saying of sorts but so true! (imagine if you had more than two!) You now have not just one but two little ones to raise and attend to, and so much time and effort is needed if you truly want to be there for them. Whenever you fill the need of one and think you’re done, you’re not. The other one will need something from you as well and the list just goes on and on. Finding time for yourself just becomes so much more difficult. I am so thankful though to be blessed with such wonderful and well behaved (most of the time) daughters. Well, I say ‘most of the time’ because my toddler is not exempt from ‘I’m escaping my nap time’ crankiness and my little one would get bouts of fussiness once in a while. They’re normal human beings too. But what’s not easy with having a toddler and a baby at the same time is that they are both in very demanding stages in their lives. Audrey requires a lot of attention and Natalie is still so dependent. And both of these needs have to be met or there will be chaos. Whenever both girls cry at the same time, which thank God rarely happens to me – I just can’t help but find the humor in it. Getting stressed out won’t help and laughing would certainly make things seem lighter and bearable. So I just attend to their needs as soon as I can, knowing that they will be ok once it’s done. I just say to myself, don’t panic hehe. When Audrey sees Natalie being carried, there are times when she asks to be carried herself (the newly independent toddler has changed her mind and wants to be treated like a baby again). So if Dad isn’t around to carry her, I simply let them take turns. Natalie first, then Audrey (and sometimes I do a countdown to let her know that it will be Natalie’s turn soon). As long as she gets carried even for a bit, she will be happy and satisfied already. Perhaps in her mind, she already got the same amount of attention since her request was honored – so it’s wise for us parents to be considerate of our toddler. This is especially true for Audrey who is still basically adjusting to sharing the attention with Natalie, our new addition. We just always remind Audrey that we love her and her sister equally, and Natalie just needs a little more carrying time because she’s still a baby and can’t do things on her own yet. - Put them to sleep!!! And where am I in the midst of all this? I try to squeeze in preparing Audrey’s food, answering work emails and squeezing in some more work if possible, cooking or supervising the day’s lunch and dinner, preparing snacks… so all the other important stuff needs to be done before the girls wake up - like praying, reading, taking a bath, working and blogging (and sometimes late at night if I still have energy). So this is why I get tired?! :D I just wish the girls took more naps together at the same time during the day hehehe. Been working on their daytime routine and it’s been successful some of the time, but not always. And sometimes I do have to enlist the help of Hi-5, Dora and Doc McStuffins! I try to limit tv watching time as much as possible but there are times that I need to allow it for my own sanity ;P And of course, my husband and I need to make time for each other as well. So we try to set our 'Us Time' and be deliberate about it or it won't happen. On some days, there’s also some disciplining happening when my opinionated toddler shows some hardheadedness. It’s not easy, but it needs to be done - and done right away. I know that I would be doing her a disservice by not correcting her and teaching her the right way even at this very early stage in her life. The book of Proverbs says that “Folly is bound up in the heart of a child” (Prov 22:15) and no matter how nice or sweet they are, this holds true. So as parents, we need to lovingly but firmly and consistently teach them the right ways – God’s ways (and both mom and dad need to be in agreement as to how their approach in discipline would be). So yeah, besides physical tiredness, emotional and mental tiredness can happen too. But despite all this ‘busy-ness’, tiredness and parenting going on, I can’t tell you how truly grateful I am. Especially when my daughters show me their appreciation by saying “Thank you mum” (this is Audrey of course J), hugging me and simply smiling at me (Natalie!). Sometimes we just find ourselves laughing together and being silly – including Natalie since she’s more interactive now - and I can’t tell you how fun that is! 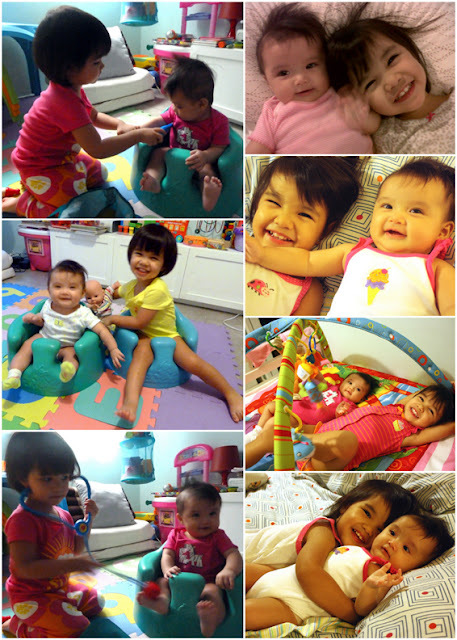 I am also so blessed whenever I see Audrey being a loving big sister to Natalie. It was our prayer that when Natalie came, Audrey would welcome her presence in the family and love her – and this prayer was answered. She loves ‘checking up on Natalie’ (like mom does whenever we’re in the dining area for a meal and Natalie is asleep or sometimes awake but just in the room) – and she would slowly sneak into the room, take a peek at her and go back out to announce that "Natalie is ok" J She also gives Natalie her toys whenever she starts fussing because of boredom. And her favorite is playing peek-a-boo with Natalie and making her laugh! This is precious! I love watching them play with each other especially since Natalie laughs so much now – it’s so infectious! We just have to remind Audrey to be extra gentle with the baby though. Sometimes she can get too excited and forget that Natalie is smaller and a bit more fragile. She likes to smother her with kisses and touch her face. But overall, I am just so delighted by the way they both interact with each other. What a beautiful entry... I am a follower of your blog, Cecil. Learned about you through Patty's blog... I admire how faithful and centered you are... May God bless you and your family more abundantly! Hello! This is such a wonderful blog. Thanks for sharing your family's life with strangers like us, teaching us a thing or two along. I just wonder, though- did you really intend to have a second baby while your firstborn is still a toddler? I would want to have the same thing but like what you said, it's not gonna be the easiest of things.